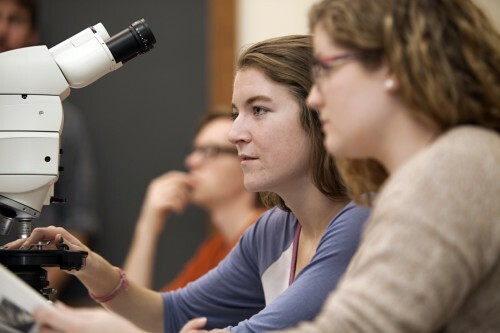 Professor Tamara Carley assists Annika Leiby ’18 and Lissie Connors ’18 with identifying a sample using the new microscopes in Van Wickle Hall. 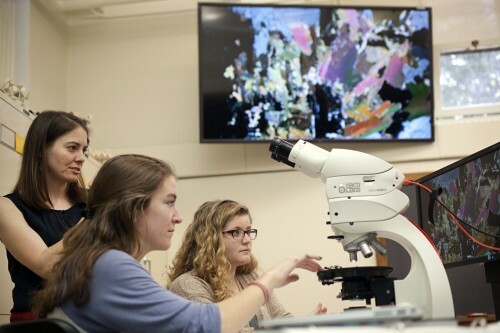 Tucked in Van Wickle Hall’s basement near a display of fossilized dinosaur bones and rock specimens, is Lafayette’s smartest new classroom—the Petrographic Microscopy Laboratory. Its extraordinary state-of-the-art technology allows students to study minerals in a whole new light. The lab may be the first of its kind in an institution like Lafayette, says John Wilson, laboratory coordinator. “Some really big research institutions have similar setups, but with the help of our Instructional Technology department, we’ve interfaced the technology throughout the room in a way few liberal arts colleges can—and they don’t have the volume of microscopes or cameras that we have here,” says Wilson. Professor Tamara Carley explains some of the functions of the new microscopes. 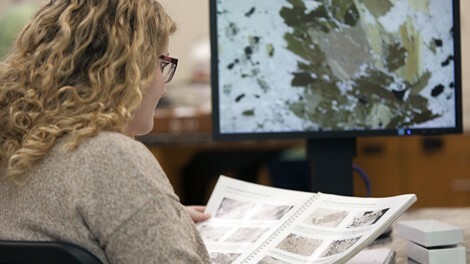 As Tamara Carley, assistant professor of geology and geosciences and the lab’s primary user, and Wilson began thinking about the lab, they identified technology to enhance their teaching, but since using the room they’ve discovered even more ways to leverage the high-tech equipment. Even a casual visitor can quickly see how this room brings mineralogy to life and makes it visually exciting—even thrilling. A room-sized U-shaped lab table is laid with magnificent slabs of polished granite. (Think: the most beautiful kitchen counter ever). But as Carley explains, each slab contains countless minerals that tell a story about how the earth’s divergent forces create and change rock structure throughout the eons. As a mineralogy lab session begins, Carley explains how she and Wilson chose each section of the lab table by examining over 200 sheets of rock from a lot at Prestige Marble and Granite in nearby Emmaus, Pa.
“We selected pieces that represented the full rock cycle: igneous, sedimentary, and metamorphic. By standing in this room and walking around our table, you get to travel through the entire cycle, and you’re able to put together an origin story for each slab. Within each one, you have a fascinating combination of mineral types, which is pretty essential for a class in mineralogy,” Carley says. 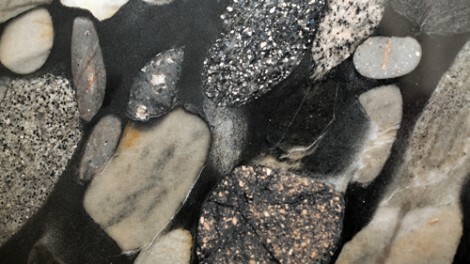 Clearly, the classroom is delivering on its promise to connect students with core mineralogy concepts. “This shows us how mineralogy applies to the outside world—you can see it happening under the microscope as it would outside the classroom,” says environmental science major Annika Leiby ’18 (Damascus, Md.) while identifying minerals in a slice of rock under the microscope. The lab contains 15 massive Leica petrographic microscopes, each fitted with wifi-enabled cameras. Images can be quickly captured and shared to mobile devices. 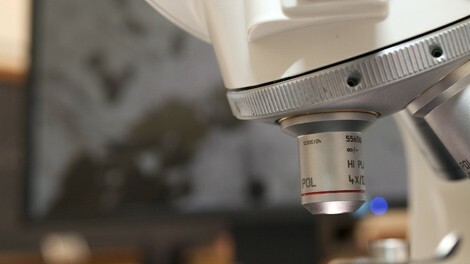 Cameras’ zoom lenses can focus on microscopic details. 18 high-definition monitors are strategically placed at stations around the room. A touch screen smart pad at the instructor’s desk transmits images to any or all of the monitors. The slabs of this massive worktable tell a visual story about how the Earth’s surface is changed by internal and external forces. 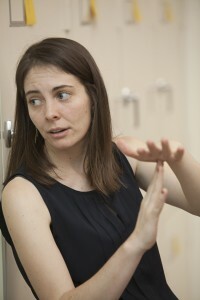 The lab’s creation arose out of an energetic, creative collaboration among Carley, Wilson, and E. J. Hudock, ITS systems engineer. Annika Leiby ’18 and Lissie Connors ’18 analyze a slice of rock. In fact, says Wilson, the room is so well built and well planned that the materials “are going to do what we need them to do for a very long time—we can get 30, 40, even 50 years out of this room,” he notes. In addition to Prestige Stone, which even gave Carley and Wilson scrap pieces of their lab table slabs so they could have slides made, Hudock worked with Vistacom, a 50- year old audio visual integration firm located in Allentown. Easton’s Jonathan Fallos helped design and built the custom table and cabinets that house the equipment.